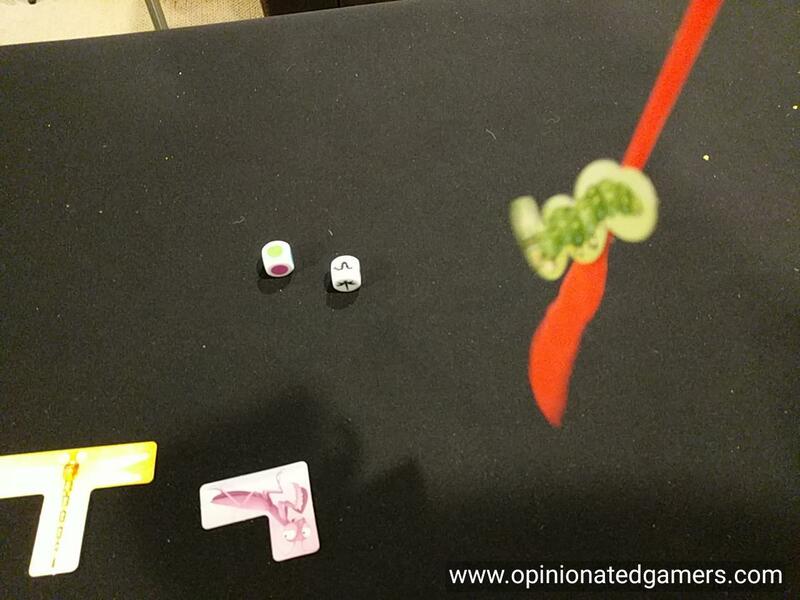 Sticky Chameleons was a game that I had actually not heard of until I got a request from the nice press contact at IELLO to review it. While IELLO has had a lots of great strategy games and coop games in the past few years, they still have retained their love of whimsical French games. You’ll never mistake this for Mountains of Madness… One, it’s in a small not-quite-pocket sized box. Two, it has 8 pink sticky tongues inside it! In this game, you are part of a hungry chameleon family. You each have your sticky tongue to fling at the food on the table. There are 6 different kinds of insects, each in five different colors. There are also 5 black wasp tokens. These are randomly strewn on the table in equal reach to all players. There are two dice – one with colors and one with insect types. In each round, someone rolls the dice. When they stop, the players simultaneously try to catch the insect which matches the color and type shown on the dice. You are only allowed to use your sticky tongue to pick up the insects. If you get the desired insect, pick it off your tongue with your hand and place it back on the table. Once you successfully do this, you score a point and gain a point token. However, if you catch a wasp with your tongue – even if you have the right insect – you will not score a point. The round ends when the player places the target insect back on the table; remember that you do not score a point if you have a Wasp at the same time. A new round begins by rolling the dice. The game ends when a player gets his fifth scoring token. There is no tiebreaker needed. The above description of the game isn’t that long – but some games are just simple wacky fun. There really isn’t much strategy here. Just roll the dice, and then fling you tongue at what you think is the juiciest bug on the table. 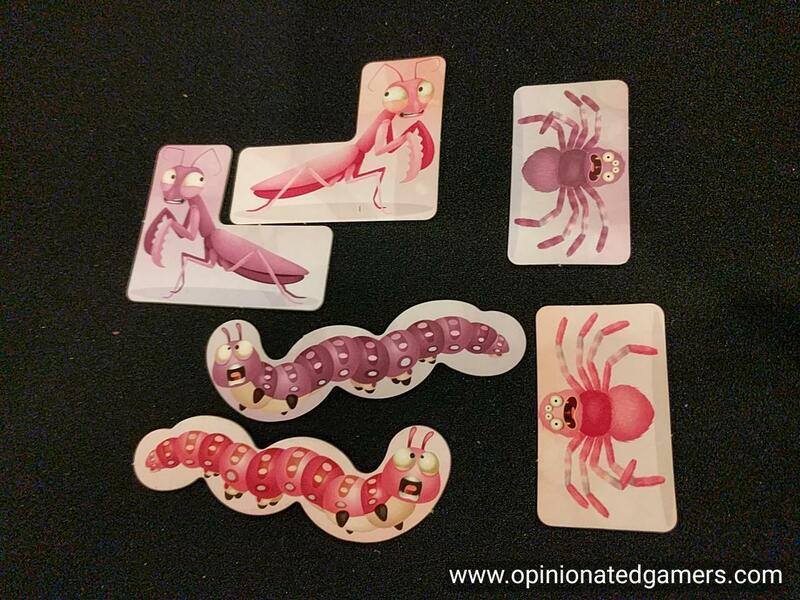 In our first game, we had the insects on a pretty small area on the table as we wanted to make sure that everyone could reach all the targets. However, what this resulted in was tongues picking up multiple insect tiles on each fling. Sure, we all had the same conditions to play with, but it wasn’t all that fun. On a second attempt, we spread the bits all over the table, and that worked a lot better for us. Another good change for us was to have two different people roll the dice so that there were two different places to look to find the target bug – in this way, there wasn’t as much of a time advantage to the player who had the best look at the dice. The game moves quick. Each round takes way longer to reset the table as it does to actually play. Many rounds were over in about… 2 or 3 seconds. 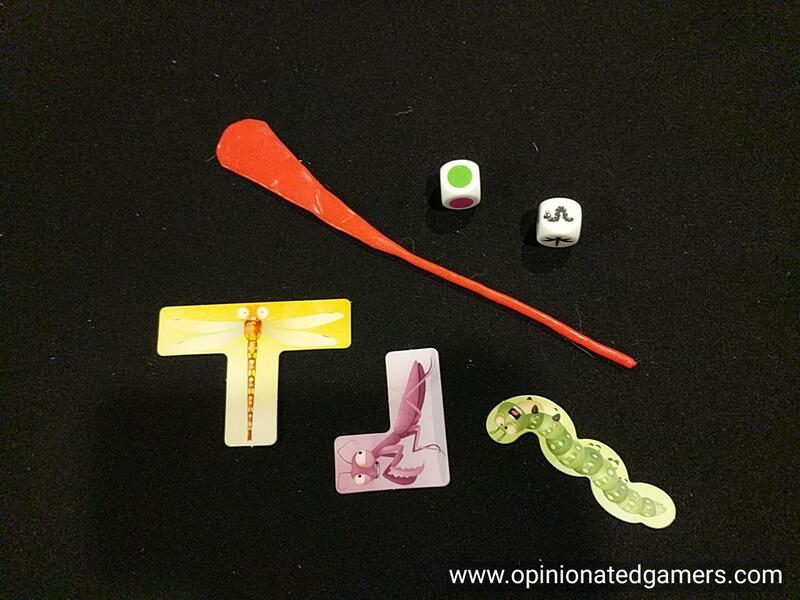 As you would expect, while there is a winner in the game (whoever gets to 5 yummy tokens first), this is one of those games that’s really more about the fun of flinging the tongues around the table and seeing who gets the right bug the fastest. The bits are thin cardstock, which normally would be a negative, but in this case, they work perfect as they are light enough to be picked up by the sticky tongues. And a quick note about the tongues – they held up well through the first 3 plays, and then they needed a quick rinse in the sink to remove the lint from them – and they appear to work good as new! My only quibble is that I have a hard time seeing the difference between the pink and the purple chits. I just end up going for either and hope I get the right one. If you’re looking for a silly dexterity filler, this could be the game for you. 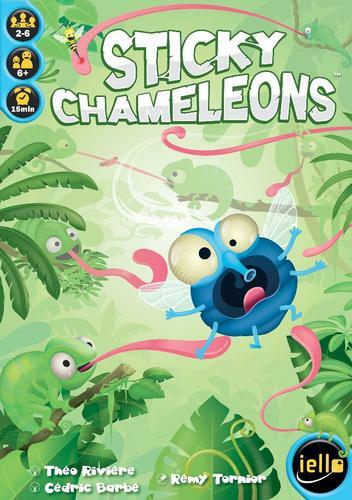 Now, I have to go in search of a third chameleon game to review tomorrow to continue the theme!